A Texas Monthly "What to Read This Month"
Rewrite Man tells an engrossing story about the challenges faced by a top screenwriter at the crossroads of mixed and conflicting agendas in Hollywood. 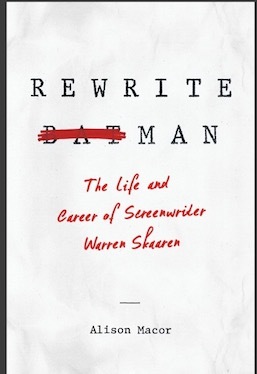 Whether writing love scenes for Tom Cruise on the set of Top Gun, running lines with Michael Keaton on Beetlejuice, or crafting Nietzschean dialogue for Jack Nicholson on Batman, Warren Skaaren collaborated with many of New Hollywood's most powerful stars, producers, and directors. By the time of his premature death in 1990, Skaaren was one of Hollywood's highest-paid writers, although he rarely left Austin, where he lived and worked. Yet he had to battle for shared screenwriting credit on these films, and his struggles yield a new understanding of the secretive screen credit arbitration process -- a process that has only become more intense, more litigious, and more public for screenwriters and their union, the Writers Guild of America, since Skaaren's time. His story, told through a wealth of archival material, illuminates crucial issues of film authorship that have seldom been explored. Chainsaws, Slackers, and Spy Kids: Thirty Years of Filmmaking in Austin, Texas chronicles the transformation of the Third Coast from myth to reality by recreating Austin’s colorful movie history. Based on revealing interviews with Richard Linklater, Robert Rodriguez, Mike Judge, Quentin Tarantino, Matthew McConaughey, George Lucas, and more than 100 other players in the local and national film industries, this book explores how Austin has become a proving ground for contemporary independent cinema. Chainsaws, Slackers, and Spy Kids begins in the early 1970s with Tobe Hooper’s horror classic, The Texas Chainsaw Massacre, and it follows the development of the Austin film scene through 2001 with the production and release of Rodriguez’s $100 million blockbuster, Spy Kids. Each chapter explores the behind-the-scenes story of a specific movie, such as Linklater’s Dazed and Confused and Judge’s Office Space, against the backdrop of Austin’s ever-expanding film community. 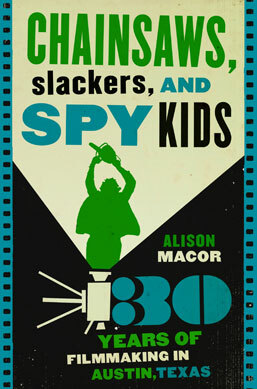 In Chainsaws, Slackers, and Spy Kids, former film critic Alison Macor weaves together these and many other stories to craft a lively narrative that tells the rollicking history of moviemaking in Austin, Texas.